Who can forget the timeless story of the cockney flower girl magically transformed into a genteel lady and the man who falls in love with her? A magnificent Lerner & Loewe collaboration yielded a never-to-be-forgotten musical gem. One of the finest musicals ever written comes gloriously to life on the Plaza stage! AMY ATKINS (ensemble) is glad to be joining the cast of MY FAIR LADY! Plaza Audiences may remember her in last season's OKLAHOMA! as Laure, Lilly in THE SECRET GARDEN, and in A CHRISTMAS CAROL. Other favorite roles include Annie in ANNIE GET YOUR GUN at Artisan Center Theatre, Guinevere in CAMELOT at Family Music Theatre, and Golde in FIDDLER ON THE ROOF at Dallas Baptist University. Amy holds a BA in Music from DBU, and teaches voice lessons at Smithfield Middle School. You can catch Amy as Bethany in Plaza's next production: GHOST OF A CHANCE. ANALAURA KEITH (Stage Manager) has enjoyed working at PlazaCo. She enjoyed working backstage in BEAUTY AND THE BEAST as scene change captain. Some of Analaura's past time is working on a novel that she has been writting for a year and just hanging out with all her friends. Analaura is proud to be part of the Plaza family and would like to thank her friends and family for always standing behind her and telling her to follow her dreams. ANDREW ALFORD (the Butler, the Prince) is very happy to be in his first stage production here at Plaza! Andrew is a native from Forney, TX and recently graduated from Oklahoma State University with a Bachelor's degree in Computer Science as well as receiving his commission as a Second Lieutenant in the United States Army Reserve Military Police Corps. He has served in the Reserves for four years and will soon be attending the Basic Officer Leadership Course in Fort Sill, Oklahoma and Fort Leonard Wood, Missouri. Andrew is a member of Brooklyn Masonic Lodge in Forney, TX as well as the Society for Creative Anachronism. AUSTIN SWEARINGEN (Hoxton man, Charile, Ensemble) has enjoyed playing such characters as Jeff in CURIOUS SAVAGE, Charlie's Dad in CHARLIE AND THE CHOCOLATE FACTORY, and Prince Charming in CINDERELLA at Cleburne High School, and Ghost of Christmas Future, Young Scrooge in A CHRISTMAS CAROL here at Plaza. Some of Austin's favorite pastimes involve designing sets, costumes, or just "ROWING". Austin is proud to be on the Plaza stage again and sharing the joy of acting with his fellow ast members. Austin would like to thank his Grandpa for always telling him to reach for his dreams. CHRIS MARTINDALE (Ensemble) is back at PlazaCo after his début as Jeffery in THE CURIOUS SAVAGE. Having only performed in one other play since grade school, Chris is excited for the experience to gain here at PlazaCo the knowledge to learn from the splendid casts he is in and will be working with. Having formerly been a zealot of the sciences, he has recently left the field to pursue various aspects of the arts. This includes music, painting, drawing, graphic arts, theatre, and writing amongst various other hobbies. He says that performing at the Plaza will be a memory he will never forget. CLAUDIA GAARZ (Scene Change Captain) is happy to be working backstage with the Plaza Theatre for the first time. She is an experienced stage manager working with the Carnegie Theatre for many productions including MAN OF LA MANCHA, MUSIC MAN (2006), ITS A WONDERFUL LIFE (2006), and MIRACLE WORKER. Claudia lives in Cleburne with her husband Eric and daughters Erika and Kathryn. COURTNEY COOKE (Mrs. Hopkins, Angry Woman, Maid 2, Lady Tarrington) is celebrating her debut performance with Plaza Theatre Company. Although not new to the spotlight, (she's played, among others, Lora in IMPROMPTU, Professor Van Helsing in DRACULA: THE DEATH OF NOSFERATU, Queen Titania in A MIDSUMMER NIGHT'S DREAM, Miss Kelly in HARVEY, and Louise in THE RUNNER STUMBLES) this is her first musical. In her "off" time, she assumes the roles of wife, mom, daughter/granddaughter, sister, and friend. She is heavily involved in her church's Praise & Worship ministry as well as writing, costuming, staging, and directing fun annual training videos for her department at work. "I'd like to thank my husband, Ryan, for letting me pursue this passion; my son, Sebastian, for letting his mommy do something other than cater to his every need; my family and friends for their constant encouragement; and the directors at Plaza for taking a chance on me." D.J. HENDERSON (Cockney Quartet, Ensemble) is excited to be in his first show here at Plaza Theatre Company. A native of Cleburne, DJ enjoys singing and playing the guitar, which he does pretty well. DJ would like to thank his Mom for taking him to rehearsals and all of her support. DARON COCKERELL (Eliza/Ensemble) is thrilled to be performing in her fourth show at Plaza Theatre Company. Previously she has appeared as Belle in BEAUTY AND THE BEAST, the Laundress in A CHRISTMAS CAROL and Martha in THE SECRET GARDEN. A graduate of Texas Christian University, she is currently wandering aimlessly toward a career...but feels blessed to have stumbled across this amazing theatre community along the way. She would like to thank her family and friend for their unending support (and dollar off coupons) and JaceSon and Tina for their belief in her. Special props to Amy for being there and to Milette for being an amazing double yet again. 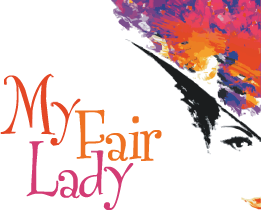 DAWN CARVER (Mrs. Eynsford-Hill, Ensemble) is most excited to be acting in her first performance, MY FAIR LADY. After seeing BEAUTY AND THE BEAST at Plaza, Dawn was hooked on plays. She decided to try for the next play and who would have thought that the next one would be one of her favorites. She lives in Cleburne, Texas with her husband, Tom, two of seven children, Caitlin and Jeffrey and favorite basset hound, Jax. Her hobbies include mothering for her children, going to the gym, and teaching an early morning religion class. Now that she has started acting at Plaza, she claims her double life as, “A Teacher by day and an Actress by night!" G. AARON SILER (Ensemble) This is Aaron's thirteenth show here at PlazaCo. You might remember his as Cogsworth in DISNEY'S BEAUTY AND THE BEAST. Aaron is happy to not carry his "mini cooper" around stage for this show. Favorite roles include Pap in BIG RIVER, Lazar Wolf in FIDDLER ON THE ROOF, Dr. Neville Crane in THE SECRET GARDEN, Burl Sanders in SMOKE ON THE MOUNTAIN, and Sparky in FOREVER PLAID. He has a wonderful wife, Milette, and three wonderful kids. In fact Aaron believes himself to be one of the luckiest persons in the world by living the dream and still having a wonderful family at the same time! GWEN MCCARTY (Techie) is back for more after Stage Managing THE CURIOUS SAVAGE. She has also worked as stage hand for “Annie” in Conroe, TX. Gwen has always loved the theatre and can never thank Jace and Tina enough for letting her help. In her other life, she works for Devon Gas Services here in Cleburne. She loves reading, traveling, old movies and dancing and, “someday”, plans to finish the novel she started after living in Iran. As an Army brat, she says she has met lots of wonderful people, but none as incredibly talented and fun as those at the Plaza Theatre. She wishes to thank her daughter, Robyn, for encouraging her to pursue her dreams. JACESON P. BARRUS (Prof. Henry Higgins) says playing here at Plaza Theatre is a dream come true for him. He has spent his life working and performing in the theater and counts BIG RIVER, THE SCARLET PIMPERNEL, LUCKY STIFF, and THE MUSIC MAN among his favorite productions. In his spare time (what's that?) he loves to watch classic movies and study American Civil War trivia. JaceSon loves to team direct with Tina, his beautiful wife of 14 years and sends his love to his favorite kiddos, Tab, Park, Cam, Edie and Mira. JAY LEWIS (Alfred P. Dolittle) is excited to be apart of his third Plaza Theatre Company show. You may remember him as Maurice in BEAUTY AND THE BEAST. Jay has also played as Ben Weatherstaff, the gardener, in SECRET GARDEN, Henry Richmond in FOUR TICKETS TO CHRISTMAS at Field Street and the Governor/Innkeeper in Carnegie Player's MAN OF LA MANCHA. His favorite roles include Tevye, Fagin, Daddy Warbucks and Felix Unger. As principal of Gerard Elementary, he is blessed to be surrounded daily by 457 awesome kids! Jay looks forward to someday soon, sharing the stage with his wife, Shauna. JOYCE CURTIS (Lady Boxington, Ensemble) . We are glad to have Joyce here at PlazaCo. JUDY 'GIGI' BARNETT (Stage Manager) is excited to get away from the Popcorn machine! Judy has become a fixture here at PlazaCo for almost a year and has volunteered MANY hours with the Plaza Theatre Guild (ask her if you want more information about helping out). This is her first time stage managing and is doing a great job. She lives in Cleburne with hubby Dale aka Big Daddy. JUDY KELLER (Mrs. Higgins, Ensemble) is back at Plaza after recently appearing as Mrs. Ethel P. Savage in THE CURIOUS SAVAGE. Other Plaza roles include Mrs. Potts in BEAUTY AND THE BEAST, Mrs. Medlock in SECRET GARDEN and the charwoman and Mrs Fezziwig in CHRISTMAS CAROL. She is delighted to be sharing the stage with two of her daughters, Jessica and Julianna. Previous experience includes FOOTLOOSE (C.A.T.S. ), THE IMORTANCE OF BEING EARNEST (Denver, CO.), FIDDLER ON THE ROOF (C.A.T.S. ), CHRISTMAS CAROL MIRACLE Artisan), SOUTH PACIFIC (Denver, CO.), and many others. She toured with the International Singers and was a worship leader at church for several years. MICHAEL SISEMORE (Freddy) is extremely excited about his first show at Plaza Theatre. Michael was most recently seen as Charlie Davenport in ANNIE GET YOUR GUN and Scarecrow in OZ at TCC NE Campus and Jack Palmer in BOYS NEXT DOOR at MVC. Michael would like to thank JaceSon and Tina Barrus and Aaron and Milette Siler for the opportunity to perform at Plaza. He would also like to thank his crew of chronies for their support, especially Daniel Robinson and Laura Neeley. To the Breevoort!!! MILETTE SILER (Eliza, Ensemble) is humbled and delighted to be playing Eliza in MY FAIR LADY, a film she has loved since childhood. You might have seen Milette as Pamela Wright in THE MAN WITH THE POINTED TOES or as a “step in” plate or milkmaid for BEAUTY AND THE BEAST. She was most recently seen as the Yorkshire maid Martha in SECRET GAREN last fall. Milette would also love to thank her wonderful, loving family for all their support and sacrifice letting mommy play her dream role. To Dana, Ryan, and Mitch: you are my greatest joy! TABITHA BARRUS (Ensemble, Dance Captain) is a 14-year old homeschooler who loves reading, writing poetry, and being onstage! Favorite past roles include Mary Lennox in THE SECRET GARDEN, Past in A CHRISTMAS CAROL, Hilda in Lolly-pup roundup's CINDERELLA AND THE GLASS FLIPPER, and a participant in THE NAUVOO PAGEANT. Tabitha sends love to her amazing friends and family who are endlessly supportive, and to her Heavenly Father for the blessing of being able to be onstage. "ROW"
TAYLOR SMITH (Ensemble) lives in Cleburne and is a student at Hill College. This is her first show here at Plaza but she has been in many productions through church and youth community theatre. Taylor would like to thank her family and every single person here at Plaza, "You guys are great! JaceSon and Tina, thank you for such a great opportunity!" ZANE LYNCH (Ensemble) is making his first appearance at PlazaCo. Some of his favorite roles include LaFou in BEAUTY AND THE BEAST, Ed in YOU CAN'T TAKE IT WITH YOU, Robery Martin in EMMA, Fritz in THE NUTCRACKER, Eric in GET FOUND, Pablo in OUR VISION, OUR VOICE 2008, and Aragan in THE IMAGINARY INVALID. "I would like to thank my best friend, Jesus Christ for giving me talents. I would also like to thank Laurie Beechman for being such an inspiration in my life."